AdMob, a mobile advertising marketplace releases what they call a Mobile Metrics Report every month. Since they serve ads for more than 5,000 mobile web sites around the world, they claim they are capable of storing and analyzing the data from every ad request, impression, and click. For every ad request, AdMob determines device capabilities using information available in the user’s mobile browser. They claim that over 5 million ad requests and impressions flow through their network every month. The reports reveal some interesting data regarding worldwide share of smartphone traffic. Contrary to popular opinion (and even here in this blog), the iPhone is nowhere close to holding the top spot in this list. 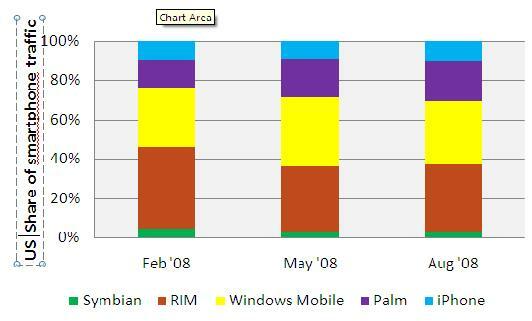 Nokia’s Symbian OS takes that honor on a worldwide basis, while out here in the States, RIM’s BlackBerry browser takes the top spot. 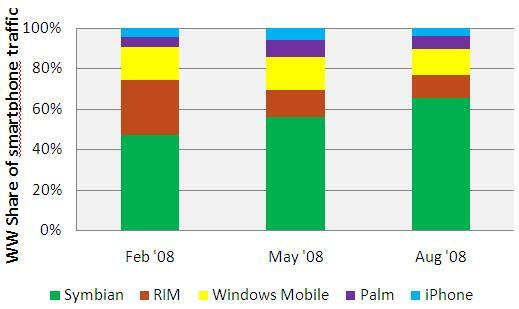 In fact, as the accompanying charts show, while Symbian’s (driven primarily by Nokia’s N-Series handsets) market share has been steadily growing from 44% to 64% on a worldwide basis in the past six months, iPhone’s share has been hovering around in the 4%-6% category. Not a bad number for a platform that has been in existence for hardly over a year, but a far cry from the market share numbers reported by Net Applications. In fact, even if you assume that Net Applications measure browsing statistics only in the United States, their numbers are not consistent with what is shown here – RIM, Windows Mobile and Palm handsets all have a higher share of Internet traffic to that of the iPhone.